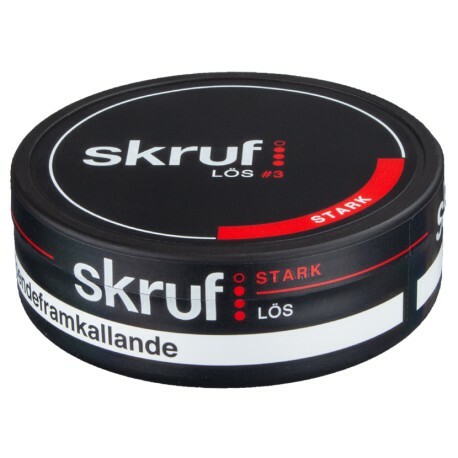 Skruf Strong Loose Snus is a classic dark loose snus with a clear and strong taste of pure tobacco flavored with Rose Oil and Bergamot. This is a high nicotine snus, rated 3 of 4 dots on the Skruf strength scale. Skruf Strong Loose Snus is a 2016 addition to their loose snus line-up, joining Skruf Original Loose snus. Skruf Xtra Strong Loose was discontinued a while back so don't look for it....unless Skruf changes their minds again. Skruf Stark Lös is ground in a special process that will make it easy to bake and use. Skruf stark lös is stronger thanks to the use of more leaf tobacco, which also gives a more intense flavor of pure tobacco. Very decent quality tobacco flavor - similar to the General Classic profile but with less bergamont and other flavorings. This has a rich, dark tobacco taste with a medium strong kick, but I find it slightly bitter. It's kind of like an oscuro cigar. I find bitterness to be the norm for strong snus products unless your going for the flavored variety. It's pretty good if your looking for a stronger los. This bakes nicely and holds together throughout, all while delivering a good flavor that lasts. It's a very well made product for those that are looking for a stronger nicotine kick. Will try again but not a whole role yet. This is an awesome snus, I was very disappointed when they took it off the market but I am glad that it has returned. Using it side by side with the standard medium strength, you can really taste the deep tobacco notes in the flavor. I usually save the Los snus for nights and weekends because it is a bit less discreet but I find myself looking forward to having a prilla of this when I get home. If you enjoy los snus, you cannot go wrong with this one.